This education package is intended as a general guide to help Australian consumers better understand broadband technologies and the factors that can influence the performance of their broadband services. It also provides guidance on steps consumers can take to improve their experience when using broadband connections, trouble-shooting tips, and answers to some frequently asked questions. This material was assembled by members of Communications Alliance, with input from other stakeholders, including the Department of Communications and the Arts, the Australian Communications and Media Authority (ACMA), the Australian Consumer and Competition Commission (ACCC) and the Telecommunications Industry Ombudsman (TIO). The information herein will be updated periodically to take account of technological and other developments. Communications Alliance is an industry representative body. We are not a provider of telecommunications services and as such we do not handle specific consumer inquiries. If you have questions that are not answered in this document, please contact your service provider. If you are looking to compare specific provider plans, comparison site Whistleout.com.au and finder.com.au has information on broadband plans. If you have any queries relating to your telecommunications service or you wish to make a complaint, please contact your service provider. Broadband provides high speed access to the internet. It is different from the formerly used ‘dial-up connection,’ and covers a range of technologies discussed below. This section covers details on the types of fixed broadband technology in Australia and detailed information on broadband speed, how it varies, and the speed needs of certain applications in addition to other topics. If you are looking for less detailed technical information, the next section on “Choosing a Broadband Service” may be for you. The nbn™ network is a government-owned network being rolled out to provide more Australians with access to broadband. It uses a combination of FTTH/P, FTTN, FTTB, FTTC, HFC, Fixed Wireless, and Satellite. It is one of the networks providing next generation broadband. nbn (the company building the network) provides wholesale broadband services of varying line speed tiers to Retail Service Providers (RSPs). nbn’s wholesale services cannot be purchased directly by consumers. RSPs use these wholesale access services in combination with their own networks and services to offer retail broadband service to their residential and business customers. when the nbn™ network will be available in your area, via which technology. Depending on where you live, you may have access to next generation broadband networks via different types of delivery technologies. These services typically deliver high and predictable speed with minimal impairments. A number of next generation broadband networks, including the nbn™ network, utilise FTTP technology. The nbn™ network offers FTTH/P download line speed tiers to Retail Service Providers (RSPs) at 12Mbps, 25Mbps, 50Mbps and 100Mbps. The actual speed you experience will be influenced by several factors, including your RSP and the plan you choose. Uses a combination of new and existing technology (including VDSL) to deliver next generation broadband. FTTN can deliver high access line speeds but those speeds are variable depending on the distance your home is from the node and may change through the day as interference levels in the home and environment vary. A variant of FTTN commonly used to connect to an apartment block or similar type of building. In this scenario a fibre optic line connects into the building communications room and then uses the existing telephone lines in the building. In addition to the nbn™ network, there are other network operators utilising FTTB technology to service apartment buildings in Australia’s capital cities and urban centres. Another variant of FTTN, works by delivering fibre all the way to the telecom pit outside a premise where it connects into a DPU that then uses the existing copper line from the pit to the home. This saves the time, cost and complexity and brings the fibre closer than Fibre-to-the-Node (FTTN). Also known as “cable.” Uses the existing ‘pay TV’ network to deliver the broadband connection to the home. Currently HFC networks in Australia are typically capable of delivering download speeds above 30Mbps, however, speed outcomes can also vary from region to region as service providers continue to develop and upgrade network links on an ongoing basis. The nbn™ network will incorporate a significant portion of Australia’s existing HFC networks. Where this is the case nbn will undertake significant network upgrades to enable the delivery of 100Mbps download speeds in all areas served by its HFC infrastructure. ADSL2+ can provide download speeds of up to 24Mbps. ADSL can provide download speeds of up to 8Mbps. However, speeds will vary depending on the distance from your home to the nearest telephone exchange or node. The performance of these services can also vary due to interference from other services or devices, the nature of the cabling and equipment in your home and the condition of the copper telephone cable leading into the property. As the nbn™ network is rolled out most ADSL and ADSL2+ services will be withdrawn from sale and eventually switched-off. This technology is delivered from a tower to a receiver on the outside of the house. It is typically used in circumstances where the distances between premises can be many kilometres. The fixed wireless service offered via the nbn™ network is capable of delivering download speeds of up to 50 Mbps, although performance can vary according to location and other factors. This technology is delivered from the nbn™ Sky Muster™ satellite to a small satellite dish on the outside of the house. It is used to connect some rural and remote locations. The Sky Muster™ service offered via the nbn™ network is capable of delivering download speeds of up to 25 Mbps, although actual performance will depend on a range of factors, including the number of customers using the service within a specific satellite beam. To ensure that all satellite users can access the service, consumers may be affected by fair use policies, used to manage the capacity of the service. Broadband speed is the rate at which data is transported, measured in megabits per second (Mbps). The higher the broadband speed a service offers, the more data can be transferred per second. Broadband speed applies to both the rate at which that data passes through to your device from the internet or server (‘download’) and the rate at which data passes from your device to the internet or server (‘upload’). Broadband speed is determined by the network access type (i.e. you may have an internet connection using ADSL, hybrid fibre cable, FTTN, etc), and a range of other factors as outlined below. Because of variations within the retail service provider’s broadband network (including access provided by nbn or another wholesale access provider) you may not always get the same speed all the time. Broadband services are often marketed according to the access line connection speed, the theoretical speed which should be achieved (or very close to achieved) in ideal circumstances. The speed of your broadband service will not exceed the ‘access line connection speed, and will often be less. This is because consumer-grade broadband services available for sale in Australia are not a dedicated connection between your home and the internet. They are a shared connection offering variable broadband speeds subject to contention by multiple users, the speed experienced by an individual user can be reduced when there is high demand from these other users. This diagram from nbn provides a background on the various factors that affect broadband speeds delivered over next-generation networks. This diagram is for illustrative purposes only. It does not and is not intended to capture all network configurations or all possible elements affecting network performance or speeds. You can also find further information in our FAQ and Troubleshooting sections. Computers communicate with each other across a network by sending blocks of information, called packets. When packets get disrupted or lost, it can affect the performance of your internet connection and therefore your browsing or viewing experience. There are many factors that affect the actual speed you experience. Examples of these include your location in relation to the broadband node, the gateway software being used, whether the site you are trying to access is based in Australia or overseas, your home wiring, your home network set-up (e.g. modem location/quality, Wi-Fi) and internet traffic congestion. When you download data from a server, the overall broadband speed and performance you experience depends on the overall network path all the way to your device in the home. This includes the host server’s capabilities, particularly if multiple users are trying to download from that server at the same time. These factors are common to all broadband technologies. Other factors that can influence broadband performance include the capacity of your service provider’s network, the type of technology being used to provide your broadband service, the broader internet infrastructure and content provider networks. The length and or quality of your ADSL or FTTN line may also impact the broadband access connection speed. Speed outcomes can also vary from region to region as service providers continue to develop and upgrade network links on an ongoing basis. Busy, or peak hours are the times when slower or more variable speeds are most common, and typically fall between 7.00 pm to10.00pm. Peak hours are the periods when the largest demands are being placed on the internet networks and servers that provide content and services. During the busiest hours, an individual’s upload and download speed tests may vary from the maximum access connection speed down to significantly slower speeds. During the busiest hours, for example, typical off-peak average speed of 10Mbps may slow significantly. In some cases, congestion may be the key determining factor for speed outcomes during peak hours. Those outcomes may differ widely across different RSPs. Some consumers are very cost conscious and will prefer to pay for a lower-priced, more congested service, even if the average performance is not as strong as that of higher priced offerings. All broadband networks will be impacted by constraints relating to shared capacity – that is, multiple consumers sharing access to the infrastructure. Next generation networks – such as the nbn™ network – are typically capable of achieving high data speeds but these networks are also impacted by shared capacity. The access types recommended by your RSP will depend on what is available where you live. Access connection speed on an ADSL, FTTN, or FTTC service will depend on distance from the exchange or street cabinet to your home. The further away, the slower your connection speed. ADSL, FTTN, and FTTC services may also slow in busy hours (i.e. 7.00 to 10.00 pm) due to congestion. HFC and FTTP services can download content at close to the full-service speed in non-busy times, but may experience lower average speed in busy hours due to congestion. In some cases an apartment building may be served by two competing FTTB networks. Where this is the case, the customer may experience a lower quality of service due to network interference between the two networks. The number of users accessing the internet within a single household may have a noticeable impact on service performance. This is more likely when that household has a relatively low maximum access speed. For example, ADSL services in premises that are more than 4km from an exchange are likely to have relatively low maximum access speeds (i.e. less than 5Mbps). For such premises, where the access line is the bottleneck, speeds experienced by multiple users uploading, downloading or streaming at the same time will be significantly slower than for a single user. Speed will also be impacted by the modem you use. If you think your modem may be a factor in not getting the speed you think you should be getting, speak to your RSP or follow the troubleshooting tips available from your modem manufacturer. There is further information in our FAQs on what to consider for your in-household set up. What do different applications need? End-user experience with high bit-rate activities such as downloading/uploading will be improved by a high-speed service. Streaming high definition video can also require moderately high bit-rates - more so if multiple householders stream simultaneously. However, speeds higher than that required to avoid buffering will not improve the user experience of streaming video. Does not require much speed or capacity and will typically work the same regardless of broadband speed. If you receive big attachments these may take additional time to download. Does not require much speed or capacity and the consumer experience is unlikely to benefit from increases in download speeds beyond about 10 Mbps. Upload speed is relatively unimportant, however if the latency, e.g. when visiting a site hosted a long way away or on some satellite broadband connections. The coded video rate depends on the quality of the content being streamed (e.g. standard definition video or high definition video) and the compression technology (codec) being used by the content provider. Standard definition video typically operates optimally at 3 Mbps, while high definition video typically operates at 6Mbps. Audio content requires much lower speeds, typically 100-300 kilobits per second (i.e. 0.1-0.3 Mbps). Audio and video streaming employ “buffering” whereby a small amount of content (e.g. from a few seconds to minutes) is downloaded to your device and stored in advance of its playback. This delays the playback of the video by that interval, but means it can tolerate short pauses or decreases in speed without interrupting playback, as long as the download speed exceeds the content streaming rate for most of the time. If the available download rate is below the video rate the buffer gradually empties and when it empties the video stops. Most streaming services can adjust their video speed down to avoid interrupting the video when download speeds reduce, and the user may notice lower picture quality at those times. Access line speed which is significantly higher (by 30% to 50%) than the video streaming rate to allow the buffer to refill when depleted. An uncongested network path from the video server that can download on average at twice the video streaming rate or faster. Packet loss can also result in slower downloading that can result in video quality degradation or stops in a similar manner to congestion. Dropouts that commonly occur on ADSL and FTTN (VDSL2) access lines can cause video to stop if the duration of the dropout exceeds the video buffer size. Long buffers (e.g. Netflix) can tolerate ADSL dropouts of 20 to 40 seconds but not VDSL2 dropouts lasting 2-3 minutes. This is the same as streaming video (see above), except that instead of using a temporary buffer, a copy of the downloaded video is retained permanently. As with streaming video, the average download speed needs to exceed the bit-rate of the content. Only requires a low speed –i.e. greater than 0.1 Mbps is normally acceptable. However, packet loss and latency can have a high impact on VoIP user experience if conversations are delayed. VOIP may suffer during peak hours if the broadband access line to the house is being used for multiple applications / by multiple users at the same time. 12Mbps is sufficient for playing most online games. However, packet loss, dropouts and delays can significantly affect user experience. nbn and other wholesale network operators do not sell directly to consumers. They sell to Retail Service Providers (RSPs), which then manage your connection to the internet, using the nbn™ network and other network infrastructure. It is important to recognise the wholesale service provides the upper limit of attainable speeds under ideal conditions. For example, nbn offers FTTH/P download access line speed tiers to Retail Service Providers (RSP) at 12 Mbps, 25 Mbps, 50 Mbps and 100 Mbps. These tiers do not describe the speed of a broadband service delivered over nbn access lines. RSPs are free to choose which wholesale services they buy from nbn and how these are offered as retail services to customers. 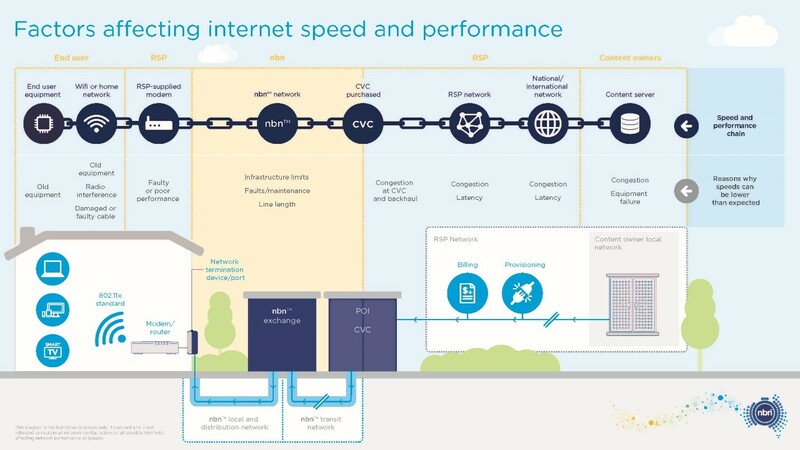 The speed of any broadband service delivered over nbn access lines is also determined by the amount of Connectivity Virtual Circuit (CVC) capacity purchased by an RSP. For example, a customer on a 25/5 plan with an RSP that doesn’t purchase enough CVC capacity may experience speeds far below the maximum access line speed during busy hours (i.e. 7.00 pm to 10.00 pm), whereas a customer with an RSP that purchases enough capacity may experience speeds closer to the nbn access line speed in busy hours. However, the actual speed that can be experienced will be determined by the customer’s access technology, plan speed, local conditions e.g. distance from the node or exchange for DSL, external interference for DSL, and in home customer equipment. Broadband speed and the broadband data allowance will be shown in your monthly plan. The broadband data allowance - measured in Megabytes (MB) or Gigabytes (GB) – is the amount of data you can download and upload as part of your plan before incurring additional charges or having your connection slowed down. This should not be confused with file download speeds, which are measured in megabits per second (Mbps). Different plans will have different limits on this amount of data. Some plans offer an unlimited data allowance meaning that your plan has no limit on the amount of data you can upload or download. Broadband speed is the highest rate at which the data you use as part of your data allowance may be downloaded and uploaded. If you are only using internet broadband service for some browsing and maybe watching a YouTube clip every now and again, you are unlikely to need a broadband package with large download allowances or the fastest advertised speeds. If, once you start using your broadband service, you find you need a broadband package with faster speeds or a greater download allowance, it is more likely that you will be able to upgrade to a more suitable plan with your ISP mid-contract. Downgrading from a higher-priced product to a cheaper one is not always allowed within your current contract period. If you enjoy downloading high definition movies, streaming television shows or you enjoy online gaming, then you are probably a heavy user. Families are more likely to be heavy users of broadband, especially families with older children. It is also more likely that there will be concurrent use of the internet, with several people connected via multiple devices. You should explain this to your ISP to ensure you choose a package that will suit your needs. What is really important for consumers is getting the best available service, suitable for their needs at the right price point. Below are several factors you may want to consider when purchasing a broadband service, to help ensure it meets your requirements. There are several different broadband technology platforms (fixed line, such as, copper-based DSL, HFC, or fibre-based technology; fixed wireless, mobile broadband or satellite broadband) and your premises may have more than one option available to it. You can use the government’s national map service to explore an indication of technologies available to you, or see the nbn™ rollout map for nbn specific information. If you do have more than one option available to you (for example a fixed line option and mobile broadband option), as a starting point, you should consider the number of users in your household; how you are likely to use your service (general web surfing or streaming video content) and flexibility of the service (for example, one with no fixed term contract or one that is easy to transfer if you’re planning on moving). These factors will be relevant to which plan has the features best suited to your needs. These plan features are discussed further below. The speed and data requirements listed are provided as a broad indication. The first step is to consider what you will be using your broadband service for. The below chart lays out the various speeds considered optimal for different uses. WHAT AM I USING MY BROADBAND SERVICE FOR? You can also read our background section on broadband speed, which explains broadband speed and the factors that impact it in more detail. nbn offers network download access line speed tiers to Retail Service Providers (RSPs) at 12Mbps, 25Mbps, 50Mbps, 100Mbps, 250Mbps, 500Mbps and 1000Mbps. The actual broadband speed you experience will be influenced by many factors, including your RSP and the plan you choose. Generally speaking, the actual broadband speed you experience will be less than the network speed offered by nbn. There are a number of factors which can impact your speed, and which you may want to consider when choosing your broadband plan. This linked image from nbn provides an overview of some of these. If you have specific concerns, the points below may address them, or you can see more information in our troubleshooting section on broadband speed. Do you use Wi-Fi or is your device connected via a cable? A service using Wi-Fi can be impacted by the distance from your device to your modem, interference (e.g. from other Wi-Fi networks) or whether there’s a wall or other equipment in between you and the modem. Are you using the RSP’s recommended equipment? Not using the recommended device from your service provider may impact your speed. Is your computer free of viruses or malware? These can impact your speed. What content are you downloading? Some content is cached (or stored) within Australia and other content needs to be downloaded from servers overseas. Congestion on overseas communications cables can impact speed, and latency (delay) – proportional to the distance between you and the server you are accessing - can also affect performance. Performance can be greatly improved when accessing content from Australian servers. The speed in which specific content reaches you will also depend on the capacity of the server that’s sending it. Are you accessing the internet at peak times? If there is a lot of "traffic" (i.e. lots of people downloading data at the one time) your internet speed can be impacted, much like congestion on a busy road. If you have many people in the same household trying to upload or download at the same time, you’re likely to experience slower performance. For services that are subject to a monthly data allowance, you should consider how much you are likely to need in any given month, and whether both uploads and downloads count towards your monthly allowance. If you want to download large amounts of data, such as regularly streaming video content, or upload large files, you should consider services with large monthly data allowance. WHAT MONTHLY DOWNLOAD LIMIT DO I NEED? Generally, ordinary web-surfing can easily use around 2.5MB per minute, while streaming video can use anywhere between 0.3GB per hour (low quality picture) to 7GB per hour (Ultra HD quality picture), although it is common to use around 1-3GB per hour. You should also check any data usage advice on the on-line content sites or gaming services you regularly use. Similarly, if there are multiple users in your household using the internet or streaming video you are likely to need a plan with a high monthly data allowance. For further information, you may want to look at WhistleOut.com.au’s Broadband Usage Guide. Prices for retail broadband services may vary because of things such as the technology, the service features and inclusions, and bundling of the service with other services. There is usually a recurring monthly fee, applied for the length of your service contract, and there may also be one-off connection or set-up costs. There may also be other charges that apply to the service, such as excess data charges (although these will only be incurred if you exceed any included data limits) or any early termination fees which may be incurred if you wish to break a fixed-term contract prior to expiration of an applicable contract period. Are there peak and off-peak data allowances? Some broadband services have separate peak and off-peak data allowances. This is more likely on technology platforms that have limited capacity (such as satellite broadband services) where it is used by providers as a tool to manage network traffic and achieve reasonable overall service performance for all users. You should check if there are separate peak or off-peak data limits, and if so, consider whether these are sufficient for your anticipated usage during those times of day, or alternatively consider how you can manage your internet habits (for example, leaving your computer to download a large file overnight during off-peak times). You may want to consider whether you wish to commit to a fixed term contract. Some providers offer discounts or free inclusions on fixed term contracts. They might, for example, include some customer equipment (e.g. a modem/router) for no charge over a 24-month contract term. Alternatively, month to month plans offer convenience and flexibility. What Customer Equipment is Included? Some providers may provide a modem/router as part of their broadband service plans or optionally for a fee. Modems/routers can vary in quality and performance and providers should have details about any modems/routers they supply on their website. Other providers may allow you to use your own modem/router, commonly referred to as ‘bring your own device’ or BYOD. If you already have a modem/router that you wish to use, you should confirm your intended supplier allows BYOD. However, you may want to consider upgrading your modem/router to ensure that you get the best performance out of your broadband service. If you have a large house you may also wish to use a Wi-Fi extender to boost signal strength throughout your house to the areas from which you plan to access your service. Service providers can recommend which equipment could meet your needs. Does the plan bundle other services? Broadband services can be bundled with other services, such as voice (fixed line or mobile) or entertainment services (such as subscription television or an over-the-top streaming service e.g. Stan or Netflix). You may want to consider whether it would be in your interests (for example, if there are discounts or for convenience) to bundle your broadband service with other services that your provider offers. What kind of technical support does your supplier provide? You may want to consider the level of tech support that a provider can offer you with your broadband service to address any service disruption or faults. Some providers offer more comprehensive tech support than others. You may wish to ask whether the provider assists the customer to identify the root cause of any instances of poor performance. Details of a provider’s tech support are usually located on a provider’s website. Support may include, 24/7 tech support, on-line chat options and/or self-service apps. What should I consider when setting up my internet? What should I consider when setting up my internet (in-home arrangements)? If you are using a fixed line broadband service such as ADSL or FTTN (VDSL2) over the existing telephone wiring, you may want to consider the configuration of in-home wiring installed at your home and/or the location of your modem/router as each can affect how your service will perform. Older in-home wiring and wall sockets may diminish the performance of your broadband FTTN or ADSL service. Avoid placing a router near other electrical devices (such as electrical dimmer switches, halogen lamps, microwave ovens, TVs/monitors or stereo/computer speakers) as well as other devices that emit wireless signals, like baby monitors or cordless phones. It is preferable to place your Wi-Fi router on a shelf or table, rather than on the floor.Careful placement of your router in relation to internal obstructions in your house (such as internal solid brick walls), as signals can be affected by these types of obstructions. Try to place the Wi-Fi router in a central location that will provide even coverage for devices used around the premises. Whether it is necessary to use a direct cable connection between your modem/router and devices to minimise the impact of interference from other devices, signals and in-home obstructions. For more information, you may wish to see our section on ‘interference. What does ‘up to’ mean when considering broadband speeds? RSPs often advertise their retail broadband services according to the access line connection speed, which is the speed which should be achieved (or very close to achieved) in ideal circumstances. This does not always reflect the speed of a broadband speed delivered over those access lines. Consumer-grade broadband services available for sale in Australia are not a dedicated connection between your home and the internet. They are a shared connection offering variable broadband speeds subject to contention by multiple users, the speed experienced by an individual user can be reduced when there is high demand from these other users. For services that run over telephone lines, including ADSL, FTTN, FTTC, and FTTB, the access connection speed a customer receives may be less than the maximum service speed because of local interference and/or distance from the exchange or node. All internet access services are affected by congestion in the busy hours (e.g. 7.00 pm to 10.00 pm) with average speeds often lower than your access connection speed. Consumer broadband connections are also asymmetric, meaning that they offer faster download speeds than upload speeds. This is by design, as consumers tend to download a lot more than they upload (e.g. watching video or streaming music primarily constitute downloading of data). Will I always get the same broadband speed? the number of people accessing a particular website. the server hosting the content you are accessing, including its location and how much capacity it has. Busy, or peak hours are the times when slower speeds are most common, and typically fall between 7.00 pm to10.00pm. Peak hours are the periods when the largest demands are being placed on the internet networks and servers that provide content and services. It is during these periods that broadband speeds are likely to be most variable and/or slower than expected. During the busiest hours, an individual’s upload and download speed tests may vary from the maximum access connection speed down to significantly slower speeds. During the busiest hours, for example, typical off-peak average speed of 10Mbps may slow significantly during busy periods (i.e. 7.00 pm to 10.00 pm). In some cases, congestion may be the key determining factor for speed outcomes during peak hours. Those outcomes may differ widely across different ISPs. Some consumers are very cost conscious and will prefer to pay for a lower-priced more congested service even if the average performance is not as strong as that of higher priced offerings. Where can I find information about the speed of my broadband service? How can I access information regarding the speed and overall performance of my broadband service? There are several sites you can use to test the speed your device can access. For example, sites such as Speedtest.net, fast.com, Speedof.me and TestMy.net are all useful resources. These sites will give you an upload and download speed which you can check against the advertised speed of your plan. Note that the results of these speed tests can also be affected by other people or applications using your broadband connection and/or by poor Wi-Fi reception or performance. It is important to note that a single speed test will only give an indication of your speed at a particular point in time and may not be representative of your average broadband speed. It is important to conduct regular tests over time and at different times of the day, to help better understand the performance of your broadband service. If you are getting a different result than expected, see our troubleshooting question on the topic. You may also consider using a broadband quality monitoring application, which you can install to monitor a range of service characteristics, including upload/download speeds, latency and packet loss. These products – some of which are available free of charge – are readily available online from providers such as Think Broadband, Neubot, Smokeping, Visualware and Beagle Software. Like speed test sites, these applications can also be affected by other people or applications using your broadband connection and/or by poor Wi-Fi reception or performance. Online broadband user forums, such as Whirlpool, can also be a good source of comparative information for consumers who are shopping around for a broadband provider and/or want to enquire as to the performance of competing providers in a specific location or neighborhood. If you are having trouble accessing broadband, the ADSL Availability Map available from the Australian Communications Consumer Action Network (ACCAN) may help you identify areas where, and the reasons why, you may be unable to get an ADSL service and when these areas will have services over the nbn™ network. You may also wish to see the nbn™ rollout map for nbn specific information. What is the difference between the advertised speeds? What is the difference between the speed advertised by network operators, including the nbn, and that advertised by a retail service provider? nbn, and other network operators, make available to consumers information about the network access service that they offer to retail service providers. Retail service providers use these access services in combination with their own networks and services to offer broadband service to their residential and business customers. Service providers are free to choose which wholesale services they buy and how these are offered as retail services to customers. This means that while a network operator’s wholesale service may offer an access line speed ‘up to’ a certain broadband speed, it does not reflect the speed of any broadband service delivered over the nbn access line. Refer to a RSP’s broadband speed advertising when assessing whether a particular broadband service is right for you. if you connect via Wi-Fi, the location of the device in your house. Slow Wi-Fi or Wi-Fi Drop-Out There may be areas in your home where you can’t receive a Wi-Fi signal no matter where your modem is placed, due to certain factors (e.g. the composition and location of walls) Move your Wi-Fi gateway to a central point in your home.Re-start your modem.Position your Wi-Fi gateway off and well above the floor.Shift your gateway away from thick walls and other obstructions.Connect via an Ethernet cable. Protect your computers and devices from malicious attacks.Test the speeds on different devices on the same connection to see if this makes a difference.Check your PC storage.Check your security/anti-virus program. Multiple Devices Sharing Data If you have multiple devices connected to your internet service at the same time, they’ll all be sharing the same bandwidth which could cause slower speeds. You may want to disconnect any active devices you’re not using. Excessive Uploading/Downloading When some devices connect to Wi-Fi networks, files can be automatically uploaded to platforms such as Facebook or Dropbox (e.g. photos from phones/tablets). This may consequently affect your download speeds. Check your device settings.Check if you have exceeded your data allowance. Unknown Background Applications Background applications such as automated updates, security updates/scans or cloud back-ups may impact your speed. Check your device settings. You may want to disable non-essential automatic updates. New broadband modems or Wi Fi Extenders & Adaptors could extend your broadband access around the home. Your ISP can provide more information on what is available to suit your needs. Why is there no speed improvement to my upgraded broadband plan? Check whether you have also changed access types as a result of changing ISPs. While you might be on a new plan, you may find you are still using the same network as your old plan. It pays to shop around. It is also important to note the maximum possible speed for ADSL and VDSL services is determined by the copper distance. Why is my speed not what I expected or what I am paying for? Download speed is the rate at which data is transferred from the Internet down to your computer and upload speed describes the rate data is transferred from your computer to the internet. Consumer broadband access technologies are designed to download data at faster speeds than uploading.Your internet download and upload speeds can be measured from an internet speed test site such as speedtest.net. It is also important to avoid simultaneous broadband activity as that can severely degrade your speed results. To get the most accurate performance of your service, it is also important to measure through an Ethernet cabled computer rather than Wi-Fi which may be much slower in some locations. Note that online speed tests are not guaranteed to be completely accurate – under certain circumstances it is possible for such a test to overstate or understate the actual speed of the services. Also, measured speed can vary widely in the busy hours (between 7.00 pm and 10.00 pm) and a low individual measurement does not mean your average speed is low. Why is my speed affected during peak hours? In the busy hours, generally between 7.00 -10.00 pm most evenings, some slowing may be experienced and more variability in speed is likely due to the unpredictable demands of many end users sharing the common shared network links. This is similar to driving on the freeway during peak periods. During the busiest hours, single download speed tests may vary from the expected maximum to quite low speeds. Demand for data is increasing by about 50% annually and so ISPs continue to monitor and upgrade their link capacities. What might interfere with my broadband service? Interference from a power source generating interference in the frequencies used by a DSL broadband service can affect the stability and performance of the service. It can come from items such as baby monitors, older cordless phones and gadgets, microwave ovens and even old TVs, LED lighting, solar panel inverters, and can even come from any of your neighbour’s locations up to a few hundred metres away. Your neighbour’s gateway could also cause interference on your DSL and other broadband service if you are both using the same Wi-Fi channel. These items mainly affect DSL services. Additionally, in-building wiring can be the source of interference for some FTTN services. Street lighting interference will generally affect a large number of homes. The interference starts when the street lighting turns on or coincides with it turning on and off during the day or night. Report to your electricity provider. Further reference on managing interference onDSL services is available here. Providers are required to publish key information about broadband services they offer in a point-of-sale document called a critical information summary (CIS). CIS documents allow consumers to compare the main features, inclusions and costs of broadband services. A CIS must include information such as a description of the service, details of any applicable data allowances and charges (i.e. recurring charges, connection costs, excess data charges or early termination fees) and whether the service is only supplied in a bundle with other services. Every provider must make their CIS documents available to prospective customers at point of sale, including on their website. CIS documents offer an overview of a provider’s service, with further details of a service, including how it is delivered and a customer’s rights and responsibilities, typically provided in a standard form contract. Standard form contract/customer agreements contain terms such as the circumstances in which your service could be disconnected, terms regarding billing and payments, and terms that relate to privacy and how the service provider treats your personal information. Many providers also apply a ‘fair use’, ‘acceptable use’ or ‘fair go’ policy to their services. These policies set out limitations on the use of a service – for instance what is reasonable and fair use of the service, and what is unreasonable and not fair use. For example, such policies usually expressly prohibit the use of the service for unlawful activities (e.g. using the service to spam other users in breach of the Spam Act, or using the service to harass, intimidate or threaten others), or in a way that could compromise the provider’s network operation or security. Use of the service may also be limited to residential use as opposed to use for commercial purposes. These policies may also include terms related to excessive data use. Note that consumers are guaranteed statutory rights under the Australian Consumer Law (ACL), details of which are available at www.accc.gov.au. If you have a dispute with your provider about the quality of your service and are unable to resolve it, you can complain to the Telecommunications Industry Ombudsman (TIO): www.tio.com.au. Access line speed – refers to the maximum achievable download speed over the physical communications line into a house. Access line speed is not the same as broadband speed; which refers to the speed of the broadband service delivered over the physical access line into a house. Buffers are primarily used for very temporary storage of data in transit between other media. Buffers in video clients are designed to be long enough (e.g. minutes) to hold enough data to allow smooth playout of the video without interruptions. Congestion occurs when total data traffic demands on a network link exceed its capacity. Initially that results in queueing delay, and sometimes packet loss. End to end internet protocols such as TCP respond to the extra queueing delay or packet loss by reducing the speed of the data connections sharing that link so that their total speed can be carried within the available capacity. Contention – Contention occurs when more than one user has data queued for transmission across a shared network element. Intermediate network links are shared transmission lines that connect two or more routers. The link capacity must be adequate to carry the total downloads required by all users with acceptable slowing in the busy hours (ie 7.00 to 10.00 pm). Latency refers to delays incurred in the processing of network data, or how long it takes for a packet of data to travel across a network. There is a difference between the inherent latency in the end to end path and the latency that is caused by the internet protocols under packet loss or congestion. The underlying latency is generally not high enough to slow data throughput from local servers, and the measured latency under congestion is the result of the internet protocol’s response to congestion. For example, the inherent transmission latency involved in accessing a site in the USA will always have some impact on your internet download speed. nbn: nbn co ltd. is the corporation building and operating the nbn™ network, which is the network itself. Packet loss occurs when some packets never make it to the receiver. If the lost packets cannot be retransmitted in time by internet protocols, packet loss can cause missing sounds, syllables, words or phrases in voice or streaming video services. Packet loss is normally low on most services except ADSL and VDSL (which is the technology underlying FTTN); for those services short, sudden episodes of interference causes line errors that result in dropped packets. Packet loss can also increase under network congestion as the latency of packets increases and buffers reach capacity. Those packet losses are a signal to the end-to-end internet TCP protocol to slow down further so that all flows match the available capacity. Real-time protocols like VoIP are more susceptible to packet loss than traditional network data applications, due to the inability to wait for retransmission of missing data. Streaming video services such as Netflix are designed to cope with packet loss, by using TCP retransmissions and using very large receiver buffers (e.g. 1 minute) to allow plenty of time to wait for retransmissions of lost packets and to smooth out some fluctuations in available speed. TCP/IP (Transmission Control Protocol/Internet Protocol) is the basic communication language or protocol of the Internet. When you are set up with direct access to the Internet, your computer is provided with a copy of the TCP/IP program just as every other computer that you may send messages to or get information from also has a copy of TCP/IP. The TCP part controls packet loss by ordering retransmissions of lost packets and controls transmission speed by slowing flows when packets are delayed or lost in transit.